It’s not all about meat and potatoes anymore. Check out our list of vegetarian and vegan restaurants to find out how Montreal’s foodie scene is keeping up with the health consciousness, in fun and delicious ways. Alternative diets are an increasingly popular method for people to achieve optimal well-being. It comes as no surprise then that two of the oldest in the book, vegetarianism and veganism, have made their way into the mainstream culinary world of popular restaurants. 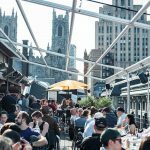 Check out our list of recommendations and find out how Montreal’s foodie scene is keeping up with this increasingly popular lifestyle. Lola Rosa is vegetarian fare that is hearty enough to satisfy even the most voracious carnivores. With extensive menus and a homey atmosphere at both their locations, they have brought comfort vegetarian dining to the McGill ghetto and Mile End alike (think goat cheese stuffed portobello mushrooms, homemade lasagna, or vegetable and tempeh curry). Be sure to leave a little note with your thoughts or a relic of your choice in the drawers hidden in their wooden dining tables—it’s like a retrospective way to break bread with other patrons—and who knows, your little limerick might just make some other diner’s day. Vegetarian, Vegan and gluten-free options. Must-try: The vegetarian poutine, made with sweet potato and golden Yukon fries, their special house gravy made from mushrooms and black bean reductions, and cheese curds. In the heart of Old Montreal lives the newly-opened vegetarian and vegan restaurant, LOV. The restaurant boasts a botanical garden theme which also reflects its menu; LOV stands for Local, Organic, and Vegetarian. The sleek and cozy dining room is accompanied by terrariums and hanging wooden wicker seats. Behind the brunch, lunch and dinner menus is Crudessence chef Stéphanie Audet whose creations will wow even the most die-hard meat lovers. The rave-celery steak with quinoa caviar and crispy poppy seeds is a crowd favourite, but don’t limit yourself to the food. LOV has a menu of organic wines, beers and creative cocktails made with liquors from small manufacturers. Vegan, vegetarian, and organic wine and beer. Must-try: The Gnocchi de casa made with sweet potato and buckwheat gnocchi in a hemp and basil pesto. Bringing vegan dishes to Montrealers since 1997, the team at Aux Vivres is committed to cooking up creative, ethnic-inspired, healthy dishes with fresh and local ingredients. Drawing inspiration from traditional Indian, Mediterranean, Moroccan, and Thai cuisines, they pack each plate full of guilt-free flavour. Their fresh-fruit-and-vegetable smoothies and pressed juices are the perfect addition to wraps as large as your head and rice bowl dishes so big you could bathe a small child in them. Vegan, with options for lacto-ovo vegetarians. Where: 4631 St Laurent Boul. Must-try: Vegan BLT, made with crispy coconut bacon, lettuce and tomato on fresh chapati bread. Wash it down with their special Tonic—fresh pressed apple, ginger, and lemon juice. Vegan, organic, and using recyclable materials when possible, The Green Panther is the perfect cafe to hunker down with your textbooks or for a quiet conversation with friends. All five locations are bright, airy, and filled with plants, beckoning patrons in with the smell of freshly-baked vegan treats. Student-friendly with locations right next to Concordia’s SGW campus and in the Plateau and Mile End, why not reward yourself for all your hard studying with a coconut-milk chai latte and a piece of homemade carrot cake? Vegan, organic, with lacto-ovo options. Where: 2153 Mackay St; 160 St-Viateur St W.; 145 Mount Royal Ave. E.; 1735 Rue Saint-Denis. Must-try: Their traditional falafel plates, which rumour has it are the best in the city. If you like it raw, Crudessence is the place for you. Their menu comprises all organic, living foods, as they are fresh out of nature. Of course everything is vegan, so “living” refers to things like kombucha and sprouts, not livestock. Their mission is to educate on healthy body and mind practices through a raw food diet, and they offer educational workshops as well as dining experiences. In addition to three restaurants, they also have counters at several supermarkets around the city, so you can get your fix on the go. Must-try: Their pad thai consists of daïkon and zucchini noodles topped with vegetables and a tamarind-spiced sauce. For the vegetarian who likes the taste of meat while not actually eating meat, ChuChai will fool the best of you with their expertly prepared Thai dishes with faux duck, chicken, and shrimp. More upscale than most of the other eateries on this list, the atmosphere is hip and caters to a young professional crowd (with the occasional influx of hipster-types). Their cocktail list is almost as expansive as their dinner menu, making this a great choice for a night out. Must-try: The Five-Flavoured Finger food. Don’t be fooled by the minimalist look of this appetizer—it packs a lot of zest into one little leaf—trust me. The quintessential hangout spot for a coffee or for a cocktail, Resonance offers 100 per cent vegan fare, made in-house. They have plenty of gluten free options available too and several kinds of plant-based milk products to satisfy anybody’s particular taste. The atmosphere is industrial-chic—think sleek counters and lots of wood and steel, but lively and warm. They’re open until midnight every day, so come and while away a few hours in the evening and take advantage of the local live music acts every night after 9 p.m.
Must-try: The Chiliguacamole, house-made bean chilli heaped onto a bowl of brown and wild rice (gluten free! ), and topped with cashew sour cream and tortilla chips. Located in the Mile-End, this cafe and local arts venue is a popular hipster haunt. At the back is the show space, where both local and independent musicians can play to their fans in an intimate space, and local artists can display their works on the happily-cluttered walls. The cafe offers lunch and brunch specials every day, using local and organic ingredients when available. Where: 5490 St Laurent Boul. Must-try: The Croque-Chèvre: goat cheese, honey, almonds, and sun-dried tomato pesto on fresh boulangerie bread. The award for freshness on this list goes to the gourmet salad bar, LIV Salades. The menu features eight main salads which are the creations of Marie-Josée Elchab who’s always had a passion for coming-up with new and original ways to make salads taste great. This bright, small, mile-end restaurant is committed to serving fresh ingredients with many produce grown right in their rooftop garden. A great place to bring a date or your family, LIV Salades takes gourmet greens to a whole new level. Must-try: Try the Liv salad which is a mix of organic baby spinach and tofu, fresh mint and basil, shiitake mushrooms, goat cheese, and a maple-champagne vinaigrette. This traditional Chinese tea house is a small and elegant salon in Old Montreal where you can enjoy an authentic Oriental tea-drinking experience. They offer a variety of loose-leaf teas alongside a modest but delicious vegetarian menu. So sit back in their classical Chinese chairs, sip some Dragon Pearl Jasmine tea from earthenware pots, find your zen, and enjoy the views of historic Old Montreal. Must-try: Lychee Red Tea and vegetable dumplings. This all-vegetarian buffet serves up a wide array of internationally-inspired dishes for take-out or to eat in their cafeteria-style dining room. Fast, easy, and surprisingly good quality food for a buffet, this is the place to go if you’re shopping downtown or on a lunch break and want to avoid the food courts and other fast food options in the area. Where: 1204 McGill College St.; 1720 St. Denis St.
Must-try: Try a variety of salads, I recommend the chickpea and mint salad and the corn and feta salad. A vegan bistro with a casual yet trendy atmosphere, this is a great place for dinner or lunch. Invitation V is a labour of love from its three co-founders, who have expertly curated everything in the space from the menu to the design to the music to offer patrons a welcoming dining experience. The dishes are all made in-house, drawing inspiration from international cuisine that the co-founders tasted during their many travels. They feature two different menus, one for weekdays and another for weekends. They strive to use organic ingredients and local suppliers. Where: 254 Bernard St W.
Must-try: Off the weekend menu is a pearl barley mushroom risotto with a nutty cream of basil sauce. With predominantly vegan and gluten-free fare, but vegetarian options as well. Le Kitchen serves up home-style fresh and healthy meals just like your mom would make (if your mom was a really, really good cook). Everything is made in-house, and is prepared daily for pick-up and delivery. Due to the high demand for takeout and delivery, you can call to order what you want early in the day to ensure that it’s ready for you. Find their food at their new Little Burgundy location, Marche Bleuet, Studio Breathe Montreal, Maison Pepin, and La Drinkerie. Must-try: Try the “Rad Thai,” a traditional style pad thai with tofu, garnished with peanuts, bean sprouts coriander and lime. Dining room and takeout counter by award-winning chef Bonnie Tees, this spot on Notre-Dame West is reliant on fresh, organic ingredients. The menu is subject to change based on seasonal ingredients and available produce, and they have ever-changing daily specials. Catering is also available. Vegetarian, organic, vegan and gluten-free options. Where: 1748 Notre Dame W.
Must-try: The Boca Burger, a veggie burger patty made with chickpea flour and black beans, topped with fresh salsa, cheddar cheese, sour cream and avocado. Crazy cat ladies (and gentlemen) rejoice! Montreal’s second cat cafe opened this year, serving up gourmet vegetarian salads, sandwiches, and baked goods with a side of feline companionship. The seven cats who call this cafe home (Luzerne, Gustave, Milady, Luciole, Chopin, Luna, Boris, Luna and Sheldon) were all adopted from local animal shelters. It’s the purr-fect place to while away an afternoon with a new furry friend. Must-try: Le Ronron salad, made with arugula, goat cheese, quinoa, pomegranate, green apple, almond slivers, and maple dressing, served with a grilled pita. Who said fast food had to be synonymous with artery-clogging crap? Copper Branch is taking healthy, plant-based dishes and making them accessible for the lunch-time rush or to grab and go (even serving breakfast options that’ll put your usual muffin to shame). With their ten locations around downtown Montreal and Dix30, there’s really no excuse to ever go to McDonald’s again. To quench your thirst they’ve also got an array of fair trade coffees, teas, and fresh juice smoothies. Plus they’re one of a handful of places in the city to serve Fentiman’s sodas (which have inspired many lustful dreams in me). Where:1251 Avenue du Mont-Royal E; 444 Rene Levesque W.; 1245 Bishop St.; 1500 Atwater Ave. (in Alexis Nihon); 600 Boulevard de Maisonneuve O; 2183 Rue Sainte-Catherine. Must-try: Aztec Power Bowl, made with black beans, sweet potato, tempeh, corn and mango salsa, pumpkin seeds, guacamole, sour cream, spiced chickpeas, broccoli, beets, turnip, lettuce, and mung beans. A favourite amongst Mile End locals, La Lumière du Mile End is a small and cozy cafe which delivers crowd-pleasing vegetarian lunch and brunch options. With an eclectic mix of vintage posters and local art adorning the walls, this place has a true Montreal character. Their weekend brunch is a fail-proof favourite for vegetarians and non-vegetarians alike, and their coffee and smoothies always hit the spot. Must-try: The vege-pate sandwich, with homemade vege-pate, cucumber, hummus, tomato, and spinach. Also try the Goodnight Irene, a hot drink made with lemonade, ginger, and honey. It’s perfectly soothing on cold winter days. For the vegan with a sweet tooth, Sophie Sucrée mixes up homemade cakes and baked goods with a healthy dose of love. Sophie, the bakery’s namesake, was owner Milene Laoun’s grandmother, who instilled in her a love of baking and a pride in serving up creations that are as artful as they are delicious. They also host weekend brunches and high tea services in their quintessentially-feminine and whimsical cafe. Vegan, organic and gluten-free options. Where: 167 Ave des Pins E.
Must-try: Coconut-Cardamom Brownie (made with vegan chocolate), and the Cherry Cheesecake. Birona Hummus Bar is coming up with new creative ways to serve a classic dip. The healthy mediterranean-inspired dishes are made-up of hummus (of course), salad, and hot pita bread with an option to create your own dish. This vegetarian-friendly restaurant has a quaint dining room with charming additions like mismatched chairs. Located on Saint-Laurent boulevard, Birona Hummus Bar is a great place to enjoy a meal and take a pause from the bustling Montreal street. Must-try: Le Jérusalem‎ comes with falafel balls topped with a mix of tahini and spicy sauce.